All my PYT’s with oily skin, where you at?! Yes, I too, am a sufferer of crazy, oily, glowed-to-the-max skin that manages to slide the beat (that took me hours to put on) right off of my face. I don’t appreciate my skin playing me like that! Alas, I have a solution and they come in the form of two Urban Decay products that I am currently obsessed with. 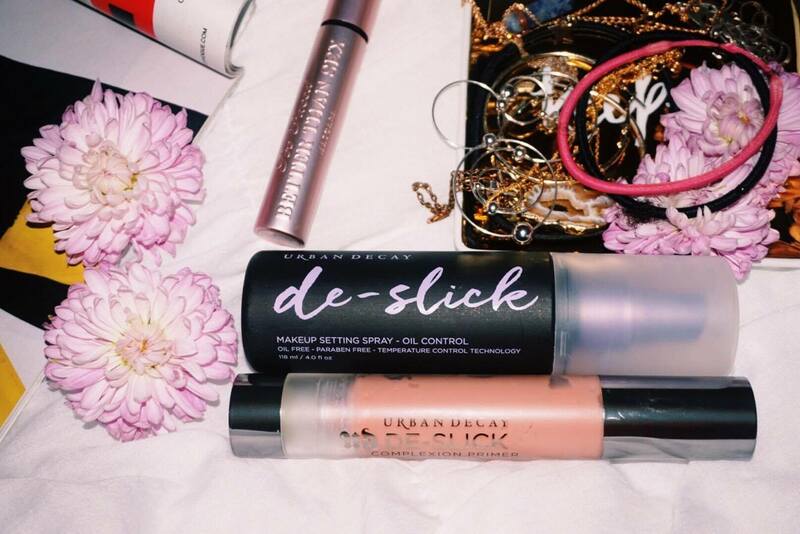 I make sure to prime my skin with the Urban Decay De-Slick Complexion Primer. It creates a sticky, yet dewy base that slows down the production of oil on my skin. Once all of my makeup has been applied, I move on to the last step & most important of all. I mist my face at least 4 times with the Urban Decay De-Slick Setting Spray to make sure that the makeup I just worked so hard to put on stays on. And, voila! You have a gorgeous face that can look fresh for up to 12 hours.